DUBAI, U.A.E., 2 October September 2015: Emirates emerged as the biggest winner at the 2015 APEX Passenger Choice Awards held at the Oregon Convention Center Ballroom in Portland, Oregon, USA on Monday. The airline clinched seven awards, topping all the categories it was nominated in. The honours included Best Overall Passenger Experience and Best in Region: Middle East for the sixth consecutive year. Emirates was also recognised for its on board product offering and airport services, being awarded: Best In-Flight Entertainment User Interface, Best In-Flight Connectivity and Communications, Best Cabin Ambience, Best Food and Beverage and Best Ground Experience. Emirates operates the world’s largest fleets of the iconic A380 and popular Boeing 777s. 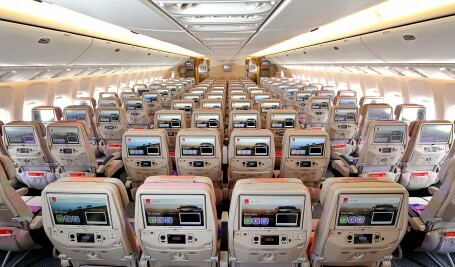 These advanced and modern jets are efficient to operate, and enable Emirates to install the latest onboard features such as: mobile phone services and free Wi-Fi for travellers to stay connected on the go, live TV including the latest sports tournaments, and an unmatched breadth of entertainment content via its ice inflight entertainment system. Emirates’ trademark service is delivered by its team of international cabin crew who come from over 130 countries and speak over 60 languages; its dining experience features great food inspired by the regions and countries it serves and a superb wine offering that includes some of the most exclusive vintages. On the ground, the airline has invested in its own global network of 38 Emirates Lounges, and chauffeur drive services, offering frequent flyers and premium customers a seamless Emirates experience. The Passenger Choice Awards, created by the Airline Passenger Experience Association (APEX), invites air travellers from around the world to rate their recent in-flight experiences. Passengers from over 200 countries voted for their favourite airlines in this year’s awards and voting took place over a two-month period from May to June. It was a week of celebrations as Emirates also clinched a special anniversary award at the inaugural Aviation Achievement Awards held in conjunction with the 2nd Gulf Aviation Networking Event 2015 in Dubai. The award recognised Emirates’ 30 years of excellence.